The Edinburgh and South East Scotland City Region comprises the six local authorities of City of Edinburgh, Fife, East Lothian, Midlothian, Scottish Borders and West Lothian. It is one of the most prosperous and productive UK regions and includes Scotland’s iconic capital city, recognised worldwide for its culture, history and architecture. The city region has a population of approximately 1.4 million people, more than a quarter of the Scottish population. Regional partners calculate that it contributes over £33 billion per year to the Scottish and UK economies. A key driver for the investment in this deal is the opportunity to address inclusion across the region. Prosperity and success is not universal across the region: 21% of children are living in poverty; there is a lack of mid-market and affordable housing; and too many people are unable to move on from low wage/low skill jobs. The deal will address these issues, create new economic opportunities, and is expected to provide over 21,000 new jobs. The region’s new skills programme, alongside improved transport and housing provision, will ensure that businesses and communities across the region will benefit and will be given the chance to take advantage of these exciting new opportunities. Build on the city region’s strengths such as its high growth sectors that will provide the jobs of the future, its world class universities that are working with businesses on ground breaking R&D and innovation and Edinburgh’s world class cultural offer. Address key economic barriers with significant new investment in housing and transport. Address issues which are constraining the region’s economic potential and which match the strategic priorities for growth as outlined in the Scottish Government’s Economic Strategy and the UK Government’s emerging Industrial Strategy. the consent of all constituent local authorities and partners. Regional partners have committed to contributing up to £501m to match fund the joint commitment from both governments. Overall this represents a deal worth over £1.1bn of investment. This document represents a “heads of terms” agreement. Further detail on the implementation of specific commitments will follow in a finalised City Deal document. This heads of terms document has been produced for the purposes of outlining the principles of the deal and does not form a legally binding contract. Innovation is the lifeblood of the region’s economy. The region is already home to world class research and development activity, much of which acts as an anchor for the development of new products and services through innovation in the private sector. In Edinburgh city centre, approximately 2,400 people are employed in 570 technology led businesses, in close proximity to the University of Edinburgh. Growth has been impressive, with an increase of 58% and 48% in GVA and turnover respectively between 2010-14. Both Governments and local partners recognise the potential to further accelerate the development of key sectors (e.g. data science, robotics, financial services and fintech, agritech, the creative and digital sectors) and to ensure the benefits of this growth are spread across the region. As such the UK Government, Scottish Government and local partners have agreed a transformational Research, Development and Innovation programme (RD&I) for the city region. This will drive further growth in the above sectors of the city region’s economy and will support wider reform and improvement in public service provision. Data storage and analysis technology that will allow large datasets to be brought together, in a secure environment, from public and private sector organisations. This data analysis repository will allow the development of new products and services within key sectors. It will be based at the UK’s National Supercomputer Centre at Easter Bush and will be connected to a region-wide Internet of Things (IoT) network. Five RD&I sectoral hubs that will draw on the data repository and support RD&I activity in key sectors. The Bayes Centre for data, a facility adjacent to the existing School of Informatics which will provide shared working spaces for world-leading applied researchers, students, existing data science institutes and industry to drive data-driven Innovation. The Usher Institute building within Edinburgh’s Bio-Quarter will house a centre for utilising data at scale to support data-driven health research, medical informatics and population health sciences. The National Robotarium will be co-located on the Heriot-Watt University campus. It will offer access to leading-edge applied research in autonomous systems, sensor technologies, existing micro-assembly equipment. The Robotarium will also have access to the resources of both Heriot-Watt and Edinburgh Universities. Scaled-up incubation space for bioscience businesses and specialist facilities at Easter Bush, delivering alignment with the Roslin Institute’s research excellence in agritech and extensive industry partnerships. A Food & Drink Innovation Campus located at Queen Margaret University which will enhance and grow the nation’s food and drink sector. This will stimulate economic growth based on both national and international markets. An Edinburgh and South East Scotland programme of investment in economic infrastructure, to ensure that businesses and communities across the region are fully able to engage in the data driven innovation opportunities including industrial and business premises, to ensure maximum impact from the innovation investment. Local partners and the private sector will invest significant additional funding to deliver key regional economic priorities including new industrial and business premises at Tweedbank and across Fife. support the development of a new generation of entrepreneurs – working in key sectors. The Scottish Government’s recent Enterprise and Skills Review identified opportunities to strengthen regional delivery to achieve better outcomes. The Scottish Government will support the city region partners to stimulate active collaboration to deliver better outcomes for all of the region and particularly those people facing significant disadvantages to securing and sustaining meaningful, high quality employment. The Scottish Government will invest up to £25m (over eight years) in the regional partnership to deliver an Integrated Regional Employability & Skills Programme. This will reduce skills shortages and gaps, and deliver incremental system-wide improvements to boost the flow of individuals from disadvantaged groups (e.g. young care leavers, workless, and those in low paid or insecure jobs) into the good career opportunities that will be generated through the city region deal investment. This will deliver better impact from existing public, private and third sector investments. This deal will deliver major investments to ensure that Scotland’s capital and its region is served by world class transport infrastructure. The recently published SESplan Cross-Boundary Study of the region has helped to show where transport investment will be most effectively targeted. Partners will put in place a regional developer contributions framework which takes account of work being led by SESplan and the emerging findings of the jointly-produced Cross-Boundary Study. These interventions and commitments, taken with the additional transport investment to enable the innovation and housing projects, will help ensure the city region continues to grow and flourish. The Scottish Government will invest up to £120m to support improvements to the A720 City Bypass for the grade separation of Sheriffhall Roundabout. The Scottish Government will provide £20m investment to support public transport infrastructure improvements identified by the West Edinburgh Transport Appraisal, alongside investment from partners and the private sector. The Scottish Government commits to continuing to work collaboratively with the city region partners on identified regionally-led local transport investment priorities through the establishment of a Transport Appraisal Working group, with an agreed and mutually shared remit and proposed outcomes. Partners will have the opportunity to be involved in and influence the second Strategic Transport Projects Review. Scotland’s capital city has a world-class cultural offer which is vital in attracting around four million visitors a year who inject £1.3 billion to the region’s economy. The new concert hall unlocked through this city deal will deliver £40m private sector investment and make a significant contribution to the ongoing success of Edinburgh’s cultural offer. Both Governments will provide up to £10m each (a maximum of £20m) of capital funding to support the delivery of a new IMPACT concert hall that will reinforce Edinburgh’s position as a pre-eminent Festival City. As part of this deal, a regional housing programme recognises the very significant housing pressures across the region and the need to provide suitable housing to support sustainable economic growth. The regional partners have committed, supported by the Scottish Government to deliver a 10-year ambitious programme of new housing across the region, delivering certainty to SMEs and maximising the economic benefit from the construction process through a substantial increase in off-site construction methods. This will be supported by existing training programmes through the Construction Scotland Innovation Centre. This joint approach between local partners and Scottish Government will support the delivery of significant numbers of new homes across the region. Key to this scale of delivery is the unlocking of 7 strategic sites. These are Winchburgh, Blindwells, Edinburgh’s Waterfront, Calderwood, Shawfair, Tweedbank and Dunfermline. Build on the recently committed additional £125 million between 2018/19-2020/21 to support the regional partners’ 10-year affordable housing programme – subject to successful progress on this initial phase. Work on the next phase of the programme and the associated funding profile beyond 2020/21 to achieve agreed outcomes will begin in 2018. Guarantee on a risk-sharing basis alongside West Lothian Council, up to £150m of infrastructure investment that will unlock up to 5,000 new homes in Winchburgh, West Lothian. Prioritise and work with Local Authorities on a site by site basis to support Local Authority borrowing and share the financing risk of infrastructure delivery required across these sites – learning from the Winchburgh approach. Provide housing infrastructure funding of up to £50m, of predominantly private sector loans, to be spent on projects that will unlock housing in strategic development sites across the region and which will build upon the regional strengths in off-site construction creating new economic and export opportunities. Provide a financing and funding package comprised of consent to on-lend up to £248m and an additional one-off £15m capital grant to enable City of Edinburgh Council to establish a new city region housing company to deliver a minimum of 1,500 homes at mid-market rent and competitive market rent levels. Both Governments will also work with regional partners to maximise the potential contribution of public sector land and property in the region to help unlock further new housing. These interventions will be linked to inclusive growth objectives through the creation of new jobs in deprived areas with investment linked to training opportunities. Strong and effective leadership and governance is paramount to both successful implementation and in providing assurance to governments, local authorities and wider regional partners. To date, the city region deal has been developed through joint working by the region’s local authorities and two consortiums, one for the business community and one for Higher and Further Education establishments, led by Edinburgh University. Local partners will demonstrate the value for money case for each project and programme before funding is made available. As such, all commitments in this document are subject to the approval of final business cases from the relevant Government, or from both Governments in the case of jointly funded projects. Partners will establish a new model of regional governance that will encompass the best practice approaches identified within the regional partnerships work stream of phase 2 of the Enterprise and Skills Review. Following the recommendations of the Enterprise and Skills Review the model will focus on the needs of the area and will include an integral role for the private and third sectors. The new regional governance will include effective engagement with Scottish Enterprise, Skills Development Scotland and incorporate senior business and industry leadership. 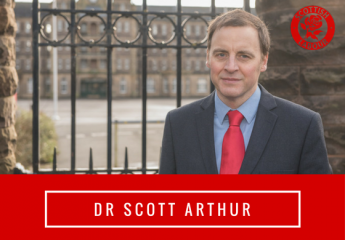 In respect of the Scottish Borders, the announcement of the South of Scotland Enterprise Agency will require Scottish Borders Council, all Agencies and Government to take an approach that ensures an effective fit between the governance for the City Deal and the statutory nature of the new Agency. 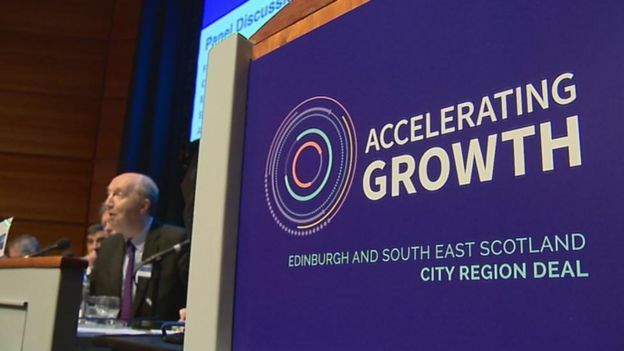 The Scottish Government is developing an Inclusive Growth monitoring framework which will incorporate clear indicators to measure progress towards the five high level inclusive growth outcomes (Economic Performance and Productivity, Labour Market Access, Fair Work, People, and Place) and will expect the City Deal evaluation and monitoring reports to align with this. Local partners will work with both the UK Government and the Scottish Government to develop a final City Deal document, detailed implementation plan with monitoring and evaluation frameworks and associated business cases for all projects and/or programmes receiving funding from the UK and/or Scottish Governments. Local partners will work with both the UK Government and Scottish Government to agree a communications strategy and an operating protocol. Both documents will set out how communications about the city deal and its associated activities are taken forward, in a way that meet the needs of the regional partners as well as the UK and Scottish Governments. ← Rent Pressure Zones – Good, but not a magic bullet.